In 1977, Susan Sontag observed that situations were increasingly being mediated by, or in fact created by the camera. Despite their disparity, events become unified by the camera for the sake of the photograph. Sontag called it a “chronic voyeuristic relation to the world”.3 The pervasive eye of the camera becomes self-fulfilling; seeing the event, being seen by the event, and ultimately creating the only remnant of the event. The eyes have it and the eyes always will. Substitute tweet for photograph and Sontag seems to have predicted the phenomenon that Boris Groys calls “self-design”: the impulse to create a deliberate, idealized online personality. What Sontag could never imagine is the level at which twenty-first century power, celebrity, and economics would rely on the successful creation of an online persona and the distressing results achievable to those with the greatest ability. Capitalism has metastasized such that the production of tangible material is no longer necessary; simply mastering Twitter is a viable business plan (or political strategy). And while many critics have voiced clear warnings about online celebrity, peak self-design seems nowhere in sight. In “Self-Design, or Productive Narcissism” Groys guides us through a fascinating examination of the contemporary condition of narcissism in relation to self-design. A portrait emerges of a “dismembered, dispersed, and decentered” self, propelled solely by the desire to be desired, and amplified by the internet. The disembodied digital Narcissus, constantly redesigned and redeployed for anonymous online approval, is understood only by the semi-sentient algorithms of Google. It’s a harrowing journey, one that leaves the reader alerted to their own indulgences. Groys redefines, or clarifies, narcissism through a closer reading of Narcissus himself, noting that he displays not simply a preoccupation with himself, but a compulsion to believe that since he is “fascinated by his own worldly image,” others will share his desire. One can’t help but see the new US president in Groys’ reading of Narcissus. Donald Trump’s power lies in his ability to side-track major controversy with a single tweet, distracting the public from a situation that would potentially end the career of a traditional politician. George Monbiot noted that “In Trump we see a perfect fusion of the two main uses of celebrity culture: corporate personification and mass distraction.”4 This binary appeals to red-state voters who have been trained for decades to believe that their opinions will never be understood or shared by traditional media, that only an outsider to the political elite can remedy their problems. Once mainstream news media sources have been discredited to the point that they are ignored, the 140-character message fills the void, with no cumbersome responsibility to the truth. In the final paragraph of his article, Groys briefly references the final scene of Antonioni’s Zabriskie Point to describe the explosive nature of contemporary, self-designed personalities. Through the lens of Lyotard and Nietzche, Groys likens the slow-motion explosion to “mankind’s persistence” in maintaining unity, at least virtually. A closer reading of the scene provides another insight. Antonioni intended the destruction of the house to be a moment of countercultural expression: the youthful protagonist’s awakening to capitalism’s evils through the imagined destruction of a symbolic modernist house. The metaphor is repeated over and over; each time the explosion inches closer. Eventually the destruction spreads to a series of smaller explosions, this time of household consumer goods: clothes, televisions, refrigerators. The intended effect was to describe the angst felt by the young baby boomers, entering adulthood and rejecting the previous generation’s devotion to consumer capitalism. 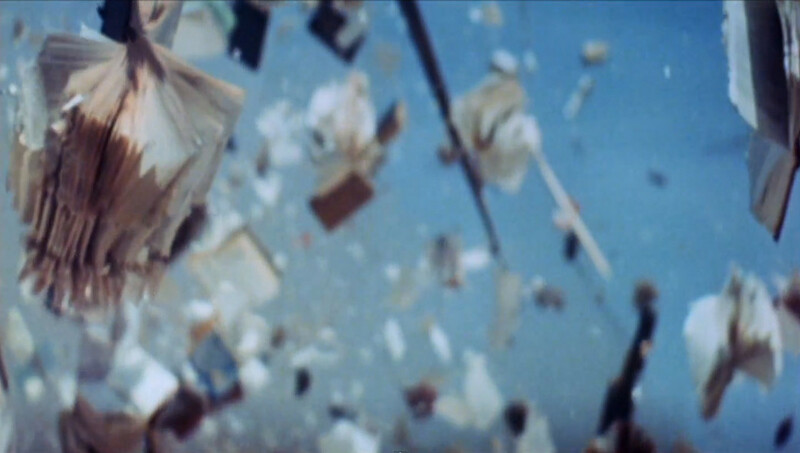 The scene abruptly ends with the annihilation of a library of books, presumably to insinuate that even knowledge is not safe from the cultural shift currently taking place. Revisiting Zabriskie Point almost fifty years later, its false radicalism is laid bare. The explosion, like the protagonist’s political realization, isn’t real; it’s the product of the imagination of a character who just a few scenes earlier expressed her indifference to politics. The soundtrack, meant to be a musical crescendo to accompany the destruction, wanders through several minutes of build-up, but the climax doesn’t sync with any noticeable increase in violence or destruction on screen. It mirrors the baby boomer generation’s preferred mode of governance: entrenched conservatism , punctuated with over-indulgent moments of misplaced and exaggerated morality. The scene is a manifestation of the failure of 1960s protest and an ushering in of the subsequent decades of neoliberalism. Now that Inauguration Day has come and gone, the explosion in Zabriskie Point becomes a Technicolor reminder of the productive narcissism that cleared the way for a Trump presidency.